Do patrons of your organization or website have an interest in military-style dogtags? Are you looking for a ZERO-COST promotion to entice your customers to subscribe, sign-up, or buy your products? If so we have a unique cross-promotional opportunity for you! We can offer your customers a FREE customized dogtag with FREE shipping at no cost to either YOU or them! Entice your potential site visitors with a FREE bonus dogtag by completing a specific action like the purchase of a product or service, or signing up to a newsletter. Enhance your offline brand awareness by optionally making some of the dogtag fields mandatory with your website or slogan. Increase your SEO as we will link back to your site from your promo landing page at mydogtag.com. 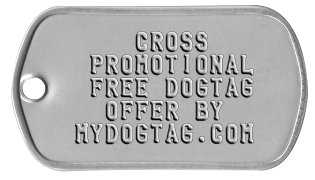 By advertising the free dogtag offer to your visitors via a link to MyDogtag.com we benefit by potentially gaining a new customer. After completing your call-to-action and receiving their FREE dogtag coupon code they will visit our site to design their dogtag, thereby introducing them to our additional dogtag products. We reserve the right to cancel the cross-promotion at any time. What does the promo page look like? Sounds Great, How do we integrate? If your shopping cart supports sending web-hooks, we can send a coupon code to your customer automatically after a sale on your website is completed. Alternatively we can provide you with a list of unique coupon codes for you to email to each customer after a sale is completed.